Considering it was a snowy night, 14 people still showed up for a 90-min., high-paced, cardio tennis workout on Oct. 29th at Roosevelt Island Racquet Center. 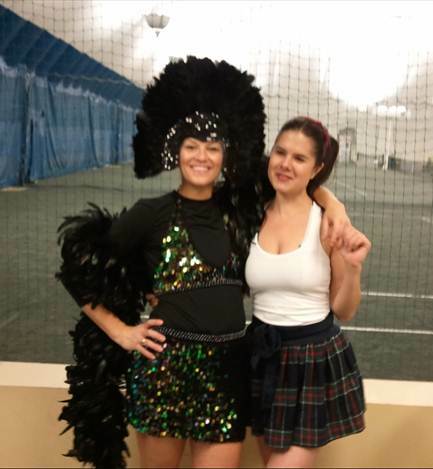 Attendees showed up in costume to get into the Halloween spirit, as music blasted on three courts and attendees performed dead ball drills and took part in live ball games. A great time was had by all despite the snowy October weather. After the workout, attendees enjoyed wine, beer and light refreshments. Roosevelt Island Racquet Center will be hosting another cardio tennis event on Saturday, Nov. 19 from 8:00 p.m.-9:30 p.m. For more information, e-mail Barbara Ordes, Roosevelt Island Racquet Center assistant adult program director and tennis professional, at bordes@rirctennis.com or visit https://rirctennis.com/forms/adult-programs-2/group-lessons/cardio-tennis/ to view the full upcoming Roosevelt Island Racquet Center cardio tennis schedule.